Steven (Chicagoland, United States) on 12 October 2017 in Sport & Recreation and Portfolio. 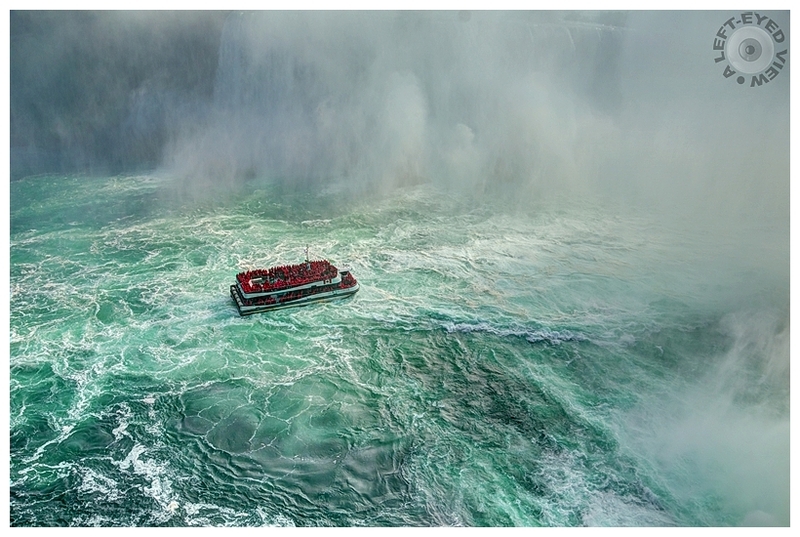 Watching the Hornblower navigate through the gorge and approach ever so closer to the Horseshoe Falls to experience the thrill of the thundering roar, awesome power and soaking mist of the Falls. I was at a safe and dry distance, about 170 feet above them. I loved the surface of the water and the "wall of mist" they were nearing. Like a model lost in the vast ocean. Always closer to the thrill yes. Impressive all the same. Cela doit être très impressionnant. de agua de las cataratas. ***** Buena jornada. Wow, they are challengers !! wonderful image...but scary too...stranded !!! If you had not told me, I would have thought this ship was battling a storm! Fantastic image. Love the dramatic feel. There is always someone who likes to go further. Who loves to feel the adrenaline. Who likes to test the limits ... until the day when something goes wrong. It's a photograph with a great visual impact, but I do not know if I would make that boat trip. It's a fantastic picture of the the violet water and the mist ahead. A very succesful shot. Fantastique bateau dans ces chuttes quelle évaporation et couleur de l'eau et contraste. Wow...Really impressiv !! Very beautiful photo ! Beautiful shot of the boat and water. The green and white water is fascinating. You're knocking them out of the park with this Niagara Falls series! Another dramatic and superb shot. This is another awesome shot. Wow Steven! What an amazing capture! It looks like great danger, but that is part of the illusion you pay for. Très belle photo , mais je ne monterais jamais dans ce bateau ..mal de Mer ..
Quelle audace ! Des passionnés de l'aventure bien téméraires ! What a remarkable image . . such amazing sense of scale. Congrats on the Color Spotlight, Steven. Impressive, love the turmoiled waters and the cinematic feel, congrats, colors are glorious ! ... et Félicitations Steven pour ce spotlight ! With a series this good, you HAD to get a Spotlight and this is so deserving. Congratulations! Très impressionnant ce cliché !!! Bien joué ! ...back to congratulate you on the Spotlight ! Well deserved ! What a great capture of this adventure. Amazing colours and the wall of mist. Excellent. We road that bost from the Canadian side!!! Great look here!! Impressive image, congrats Steven !!! breathteaking and wild! thumb up! hoped you would get one going to this spectacular site. Bravo !